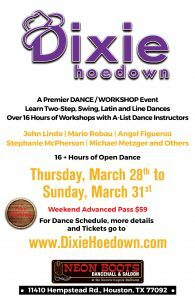 DIXIE HOEDOWN – DANCE WORKSHOP EVENT! Learn more about our Workshop Schedule, Staff, Dance Venue, Hotels to Stay (and Where to Eat & Drink! ), Getting to Houston, Things to do in Houston, and more.